My girlfriend was driving my 1987 300SDL, when she heard a click and suddenly was only able to accelerate to 3 mph. I figured the pedal had disconnected from the metal lever beneath it, and this proved to be the case. It's hard for me to see down there, so I tried to reconnect it by feel. I only managed to slightly reposition it so that now we can drive at 20 mph with a pedal depressed. I can tell that unless the pedal is really connected to the lever, there is not good contact. 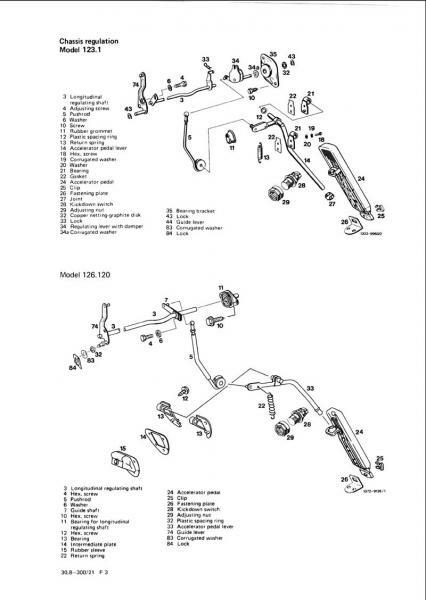 Does anyone have a diagram which might help me reconnect it? Look in the engine bay around the oil filter. Is the rod that runs forward to the IP properly seated in the bushing in the bulkhead? Is the bit that rises from the pedal properly bolted to the rod? Is rod 3 properly seated in bushing 11? Is bolt 4 present and tight? My cars are older but likely to be of similar design. If the base of the pedal is disconnected just remove the pedal and push on the rod without the pedal to make the car go. The upper part of the pedal disconnects from the rod easily. If you twist it around to the left so you can see the back side of the pedal then it will be obvious how to remove it. The base of the pedal is connected to a little tab with a plastic clip and I have seen cars on which that little tab has rusted out so that the clip no longer holds. This can happen even on relatively rust-free cars if the a/c condensation drain is not working right. Your pedal has a living-hinge part that connects it to the rod behind it, not a common failure but the living hinge can eventually fail. There is another living hinge in the bottom of the pedal. If the pedal needs to be replaced I believe it is the same as the 124 pedal, you remove a clip at the base and slide the plastic pedal assembly up off of the metal tab in the floor, rotate it 90degrees (on the vertical axis) to line up the tab on the rod with the slot in the hole to slide the pedal assembly off of the end of the rod (this is from memory). Thanks, guys, for your help. It did turn out to be the pedal, which in Los Angeles was around $13. I took it to my trusted mechanic where it was attached, after which I had an oil change with a very good oil... the French oil, Motul. If you're ever out in Los Angeles I highly recommend Renner Motorsports in Inglewood.